Ekiti State Governor, Ayodele Fayose, has said his state will not release any portion of land to serve as grazing reserves for Fulani herdsmen, but will support the establishment of ranches for herdsmen in their local communities. In a statement signed by his Chief Press Secretary, Idowu Adelusi, on Tuesday, Mr. Fayose said moving large ‎herds of cattle from one point to the other was no longer fashionable going by the attendant risks and conflicts being generated. “By the powers conferred on me by the Constitution of the Federal Republic of Nigeria as the Executive Governor of Ekiti State, I reserve the rights to allocate land in the state to people and we will not give an inch of our land to any cow rearer,” he said. “Moving cows from one place to another is no longer fashionable. It is very primitive, provoking and could lead to another civil war. “We cannot open our eyes and watch as cows destroy our farmlands. We need to ask some questions. “The herdsmen who go about carrying AK 47 to kill people, who gave them the licences for such arms? Or are they above the law? How did they get those guns? ‎Who purchased the guns for them? What is their agenda for arming them? 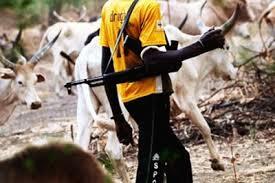 Has the Boko Haram translated to the herdsmen?